Anyone interested? I'm going to reach out to Tumblr next. Re: Soraya Saga Tribute Project? Kat I would like to help anyway I can. Let me know. I sense your passion on this. I AM ALL ABOUT THIS. |3 I'd love to contribute! If I was anywhere near good at art, I would totally join in. But I shall cheer you guys on! Great idea, Kat! I only really know of Xeno being in her works, heh. But I was already planning on drawing a few characters. (Like KOS-MOS.) So perhaps I could be in as well? I was thinking it'd be cool to do a decentralized delivery to her via twitter for the folks who have twitter, and put a PDF together of folks who don't twitter? :3c This project isn't necessarily art-only. Being a flash mob on twitter would be cool, too! I was also thinking it'd be cool to send her stuff that we know she likes, like Transformers and JJBA fanthings? IDK. I get real nervous sometimes because she's so awesome and I don't want to come off like a quaking fangirl. And they are totally some of the best twins of any video game, imo (though I guess Albedo and Jr. would be another one of my favorite pairs of twins, if we want to be technical about it). Though, this is coming from a twin himself who doesn't care much for twin stereotypes, so Sabin and Edgar was a breath of fresh air. Also, Soraya wrote Soma Bringer, though I can't really comment on that game myself. :/ Anyway, I'm eager to see what you guys make! I'm sure she will love it either way! @katimus_prime wrote: I was thinking it'd be cool to do a decentralized delivery to her via twitter for the folks who have twitter, and put a PDF together of folks who don't twitter? :3c This project isn't necessarily art-only. Being a flash mob on twitter would be cool, too! Wow, what a strange coincidence! I'm playing Final Fantasy VI now. Those two are really quite awesome. I already thought Xeno itself was awesome, but FF6 too? That's amazing. Perhaps I could draw one of them then. (Edgar, totally Edgar.) I already respect those who've worked on the Xeno series for making one of the most awesome things I've ever experienced, so I feel I must give one of them some tribute! I probably won't have time to finish it by the date because my work week's just started, but I'll see what I can cook up. Well I do not have many skills for drawing, and I do not pretend to know all is in the mind of Soraya Saga (aka Kaori Tanaka). To resumate, this doujin explains all the background elements about Edgar & Sabin that couldn't be inserted in the game itself. They are (globally) very interesting. The doujin deals also with other main characters of FF VI. The doujin is of course in Japanese, but some partial translations are scattered on the net. Remember : some names are different in Japanese (Sabin = Mash). I heard she also wrote a very good doujin of Xenogears, but I couldn't find anything about this. As for Xenosaga, it is probably not a good idea to even mention the name of "Xenosaga" : too much bad memories for her. Anyway I want to say that you have all my support (and my knowledges of FF VI) in this project ! Oh man, good to know that, Val. The last thing I'd want to do for her birthday is upset her. Ah, good call. :E I know she had drawn and maybe tweeted about Xenosaga stuff before, so I wasn't sure if it was OK to bring it up. 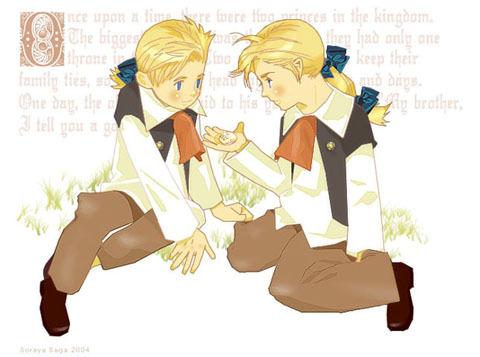 On the other hand, I've always kinda wanted to do a FFVI thingy with the Figaro boys and dedicate it to her. Heyhey, sorry I kinda dropped the ball on necroing this thread, but Soraya-san's birthday is on the 18th, which is next Saturday! I'm a lot more behind on this than I wanted to be (damn this overtime at work)! Well I have an idea of present which could be quickly done. But maybe she still can be touched about the only Xenosaga game which wasn't cut off by Namco : Xenosaga Pied Piper. Correct me if I am wrong, but the story part of this mobile game was written by her only, right ? So I have tought about the Xenosaga Pied Piper fan-manga made by フォレスト (Forest). Actually, it is a video-fan-manga. Why not compiling all the videos (done so far, the work is half-way, roughly) in one video, then posting the video on a video sharing website (my YouTube channel for example) ? Then we will just send the link to the video to her. To do this, we need a Nico Nico Account, a software which extracts Nico Nico videos, and a MovieMaker-like software (for the compilation). I own all of this. I think that'd be pretty thoughtful, but it's also kinda proof of piracy that someone recorded it in the first place? Since your suggestion to keep things off the subject of XS for her, I've been looking to what she's been drawing currently and have my gift related to Steel Ball Run. To my thinking, if she likes something enough to do a doujinshi during a time when she'd be in crunch for XBX, she must really really like it a lot. From what I recall, she has stated that Pied Piper was only mildly adapted by Monolith, to a lesser extent than Episode II. Though as of 12:50pm EST, it's 1:50am in Tokyo, so that's only a matter of hours, holy crap. Sorry for the double-post, but, it's 12am where I am, so I'm postin' my thing to Twitter! I didn't know the second one. I happened to catch a tweet from her regular twitter saying that she'd put all her non-game related stuff on sorayatokyo. I think since she's been posting so much, and so many people are watching her for XBX and Jojo fanart, she decided to put her art in one place. I'm just glad I caught that tweet when I did, because I absolutely love her art.